The last Korean dream at The International 5 has been ended by Vici Gaming in the opening series of the day four in Key Arena after a dominating performance. 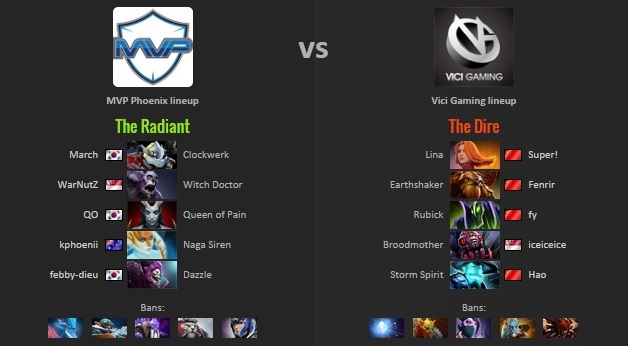 started fairly good for MvP.Phoenix who had a really strong ganking oriented draft with good counters to Fy’s Rubik and a QO Slark to face Super’s Lina in mid lane but Vici Gaming’s last pick made the difference, Hao bringing the first Morphinlg on the big stage of TI5. Early to mid - game it was all about trading kills with a slight advantage for MvP.Phoenix who won a big teamfight around the Roshan Pit 23 minutes into the game and grabbed the first Aegis of the game for QO but once Hao finished his Eye of the Skadi and Lina got a Ghost Scepter to save herself from QO and March’s right clicks VG started to clearly dominate the less experienced South Korean team. A Roshan kill at the 35 minute mark for VG combined with a few misplays from QO had as a direct result the fall of two lanes of racks for MVP, melted down within seconds by an overfamed Morphling and game one was a wrap. For the second game MvP.Phoenix planned for a late game scenario with a core Naga Siren for kpii but they got seriously outdrafted by Vici Gaming who picked Broodmother for iceiceice and a Storm Spirit for Hao. 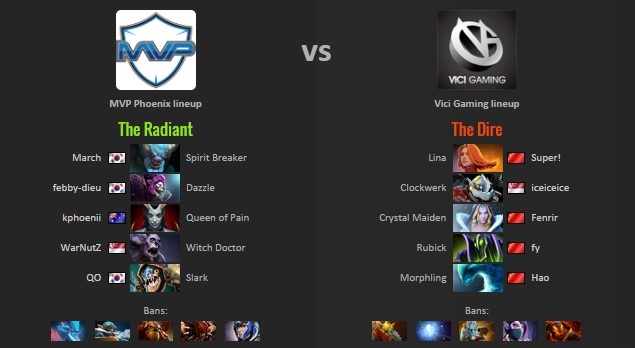 The early game was completely won by VG, especially by Super in mid lane and icex3 with his offlane Brood. Super’s lina put a lot of pressure on Qo’s QoP and forced the two MvP supports to rotate in mid lane to keep QO alive with their heals and that created a lot of space for Hao who farmed a very fast Orchid. After VG took all the tier one towers from MvP, iceiceice invaded the enemy jungle and crippled Naga’s Radiance farm quite bad. VG’s dominance was clear but it became even more certain when Fy on his Rubik managed to solo kill QO at the 21 minute mark. Although kpii finished his Radiance in the first 20 minutes, he had no other important items and after he got picked off a couple of times by the bursty VG cores, he got sidelined with no buyback which allowed the Chinese to start demolishing the radiant base. After 33 minutes of struggles MvP.Phoenix lost the second game as well and finished their run at the International 5 in top eight.